When it comes to STEM (Science, Technology, Engineering and Math) education, hands on learning is paramount. To that end, we are pleased to announce ExxonMobil’s recent donation of $2,500 to the Timberlane Middle and High schools will be used to further enhance the classroom learning experience in our STEM program. This community partner donation will allow the school district to purchase water quality testing and modeling equipment which will be used to engage students in ‘real-life’ science by collecting and analyzing their own data. Through hands-on experience at the Beede Group remediation site, we will be able to enrich students’ understanding of concepts related to ground water, pollution and remediation. This former Waste Oil Site on Kelley Road in Plaistow has served as classroom on several occasions where high school teachers Lauren McPherson’ and Bethany Weiss’ students have worked side by side with scientists and engineers on various projects. “The Beede Site and all the professionals involved, has been an invaluable resource in augmenting the environmental education of my students,” states Bethany Weiss TRHS teacher. In addition to the equipment donation by ExxonMobil, the Beede Site Group has also hosted Timberlane students for numerous educational site visits, provided guest speakers for engineering week, and provided funding for the April break STEM Camp. Timberlane looks forward to continuing this partnership with ExxonMobil and the Beede Group that includes an upcoming bat environment enhancement project with our zoology and woodworking students. This is just another example of the programming opportunities designed to increase the rigor, accountability, evaluation and support that drives student achievement. 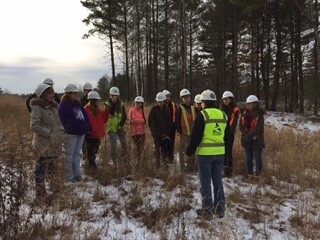 TRHS AP Environmental Science class tours the Beede site led by Woodard and Curran biologist Keri Lauer.